-Jon Roe – Freelance writer who covered golf for the Minneapolis Star Tribune for more than 30 years. It’s a tougher decision than figuring out how much break to play on a six-foot sidehill putt. The difference is, however, you¹re going to make the right call no matter what you decide to do. That’s the beauty of the Brainerd Golf Trail. There’s something for everybody, no matter the skill level of the player. A challenging golf course or one that’s more forgiving. A golf course designed by a world-famous architect or one laid out by a layman who merely enjoys the game. A more upscale golf course ­ although still a far cry from the sticker-shock tracks of other destination sites­ or a course so friendly to the bankroll as to barely make a dent in the budget. Indeed, that is the beauty of the Brainerd Golf Trail. There are all kinds of choices, and really no bad decisions. It’s a string of 10 golf courses, all with in a drive of 45 minutes of each other, and every one located in a backdrop of lakes and woods and ­ most of all — enjoyment. In the last two decades, the Brainerd Golf Trail has grown into one of the top 50 golf destinations in the world, according to Golf Digest. When each golf day ends, there are 450 lakes to sit by, fish on or swim in. And when the sun goes down, there are inclusive meals at the bigger resorts, or restaurants for those staying in cabins, cottages or motels. Of course, visitors can find places in Brainerd, Baxter, Nisswa, Pequot Lakes, and Cross Lake for shopping, browsing and all the other activities of a destination location. The major golf resorts are Breezy Point Resort, Cragun’s, Grand View Lodge, Madden’s Resort and Ruttger’s Bay Lake Lodge. 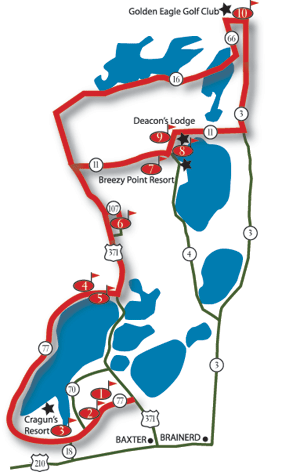 But there also are numerous motels and cabins available through the Brainerd/Baxter Lake Area. Each of the major resorts offers a full-size golf course (or more than one) as well as short courses for beginners or for the entire family to play. Cragun’s, a resort complex replete with two championship 18-hole courses designed by world-renowned Robert Trent Jones, Jr., and a Reversible Par 3 course. Named the “Midwest Course of the Year” in 2002 and 2003, the two championship courses are the Dutch Legacy and the Bobby’s Legacy and they carry the “World’s Largest Audubon International Signature Sanctuary” label, surrounding a 104-acre lake with 1,450 feet of bridges over wetlands and a waterfall. At Breezy Point, visitors can avail themselves of The Whitebirch course, another full-size layout rolling over undulating land, or the shorter Traditional Course with a par of 68 for those who play golf more for recreation. If a visitor wants a more challenging 72 par championship course, there’s Breezy Point’s nearby Deacon’s Lodge, designed by legendary Arnold Palmer. Deacon’s Lodge, which offers cabins adjoining the practice range, combined Northwoods views with waste-area obstacles. And at the Golden Eagle Golf Club at Fifty Lakes on the northern end of the Brainerd Golf Trail, course architect Mike Morley and Bruce McIntosh has incorporated the dramatically rolling terrain in a scenic layout offering many views of the surround lakes and woods. The panorama is well worth the $88 fee (weekends). With all of the playing options, and price ranges, the Brainerd Golf Trail offers challenges to the player’s ability to make selections whether it’s picking the kinds of course or picking the kind of shot to play.